Sister Lakes in Southwest Michigan. Magician Lake is an All Sports Lake. Great for Swimming, Fishing and Boating. Please email me before booking to confirm availability which is outlined below. My calendar is not updated daily. We do rent year round. * 60 feet Sandy Lakefront on popular "Magician Lake". Lakehome is on the east side of Lake which is in high demand because of the shallow, sandy bottom and beautiful sunsets. Perfect for families with children. 5 bed 4 bath. Sleeps up to 20. We are usually booked 8-12 months in advance. The Lake is known for good fishing with Northern Pike, Large Mouth, Walleye and Blue Gill. Sister Lakes area has the famous Driftwood Ice Cream Parlor, Sister Lakes Brewery, The Strand Restaurant, 5 Mile Drive-In and a few others. Near by is St Joe, New Buffalo, South Haven, Lake Michigan, Saugatuck. If you're into wine, Magician Lake has many Winery's close by. I've worked very hard to make sure all families have a great time at our Lake House. Home rentals on Magician Lake are in high demand. My Calendar is not always updated so if home is booked, I have 3 other homes in the area that you can contact me on as well. Please email first to find out availability. I purchased this property to enjoy great memories with my family and friends! I live on the south side of Chicago and have been coming up to Sister Lakes my entire life. It was always a dream of mine to own property on one of the many sister lakes. I finally was able to make it happen after many years. I'm a Firefighter/EMT in the south suburbs of Chicago. I love staying in Sister Lakes and hope you will enjoy Magician Lake as much as I do! I can accommodate up to 20 guests. Parking for 10 cars. Master bedroom has a King size bed, bedroom 2 an 3 have a queen size bed, bedroom 4 has 2 bunk beds with full size mattress on the bottom and twin on top also bedroom 4 has a twin bed. Bedroom 5 has 2 twin beds. Dining table can accommodate 8 also in the kitchen the island can fit another 5 people to eat if needed. 2 full size refrigerators in the home 1 in kitchen and 1 in walk out basement by the wet bar. I provide the propane for the weber grill. Also I supply all the wood for the fire pit which is lakeside. Home has been recently updated with new carpet, new paint, new vinyl siding, new water well with filter, stainless steel appliances. Patio furniture and picnic table on upper and lower deck. The biggest benefit for families with kids is that our side of the Lake is very shallow so it's great for the kids to play in the water. Perfect place for extended family to prepare for (and recover from!) a family wedding (@ nearby Sundance Studios in Millburg). Very well maintained and furnished in a beautiful setting. There was room galore for everyone - room to gather and room enough for those that wanted to, to retreat to a secluded corner of this lovely lake home. Highly recommended. We had an awesome time staying at this clean, spacious and well maintained lake house. The owner, Bill, went above and beyond to make sure our visit was exceptional. The house has gorgeous sunsets and is located on the sandy bottom part of the lake. We enjoyed spectacular fireworks and rented the pontoon boat for the week too. The house is children friendly and the kids really enjoyed all the fun in the lake. We had 10 adults and 4 children and the house was very accommodating for everyone’s needs. I recommend staying here and would definitely like to come back again! Great house! Great Boat! Great Lake! Great Owner! I recently rented this home on Magician Lake for 8 adults and 6 children for the week preceding Father's day. Bill was very courteous and welcoming upon our arrival, showing my wife and I where everything was in this home and how to operate the boat; Bill even brought two small life vests for the smaller of the children, which was above and beyond. Bill made sure the boat was fueled and ready to go for our group (though we had to wait a couple days due to inclement weather). The home was clean and prepared, getting situated with our large group was easy due to Bill's efforts and the organization of the home itself; while there were a few minor issues (couple of outlets non-functioning), none were of any concern.The neighbors were very friendly and helpful as well. The lake was fairly quiet all week, which allowed us to explore and putt around at our leisure; there was an awesome little channel which looped around and let out not too far from the house's dock (highly recommend a loop or two). I cannot say enough positive things regarding the stay overall and would gladly rent this property again in the future. Thank you!! I'm glad your family enjoyed your stay on Magician Lake. I hope to see you guys next year. We had an absolutely wonderful time in this home. The home is very spacious with a wonderful layout which provided more than enough room for our large family. The views of the lake from indoors as well as on the deck are gorgeous! Loved that we could walk right outside and the water was right there! Perfect for the kids as they could just walk right in to play. Homeowner was great and made himself available to us if needed. We appreciated the dining suggestions as well. We will be back!! Thank you for the comments. We look forward to seeing you again. I really wanted to leave a five-star review, but just couldn't. 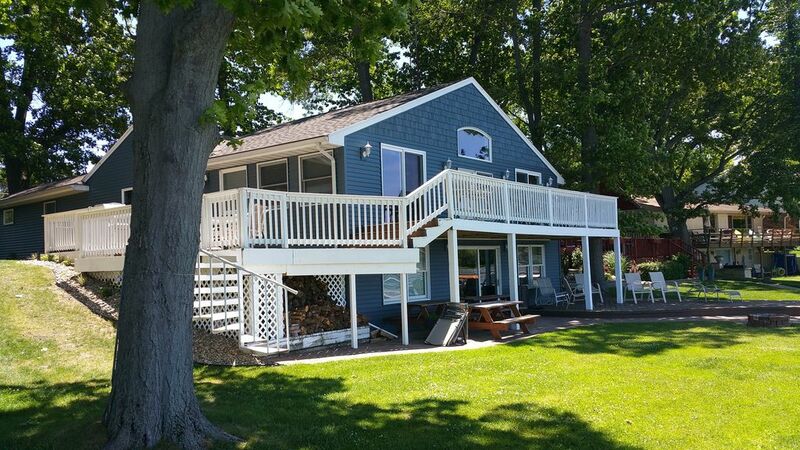 The house is perfect for large groups and is surrounded by great neighbors and a beautiful lake. Communication with the owner (Bill) prior to arriving was good. We had 15 people on Friday night (4/20) and 17 on Saturday (4/21). We headed out for dinner at a place the owner suggested, The Strand. Great food with slightly slow service. We headed back to the house and had a wonderful night of drinks, games and music. Fun, successful first night! The problem started on Saturday around 10:00 am. The toilet in the basement was clogged. After trying to plunge it, I heard water behind me and noticed sewage coming up from the shower and spilling out to the floor. I immediately closed the shower door and called Bill (10:02 am). After speaking with him we discovered that the ejector pump was overflowing and going through the wall to the back bedroom and into the hallway. We pulled the bed away from the wall, and cleared all personal items from the back room. Only four people had showered, but we stopped all use of any water. I texted pictures. Bill called his plumber, and we were told her the plumber would be there later in the afternoon, and that Bill would be at the house in 90 minutes. It was 11:18 am. We sent most of our guests off to explore the surrounding area since we couldn't use any of the bathrooms. At 1:46 pm I texted Bill to see where he was. He said he would be there in 10 minutes. Bill showed up just after 2:00 pm to check it out. He said the plumber would probably arrive around 3:30 pm. At 3:37 pm, after many trips to the gas station 10 minutes away, I texted Bill to see if we could begin showering/using the toilets. No response. The plumber finally showed up around 5:00 pm and was there for two hours. He said that plumbing was clogged from feminine products. Thankfully, no women in our group was using those products at the time, so I don't know when the clog actually happened. I didn't hear from Bill again until Wednesday (4/25) - 4 days later! He thanked me for the update I sent him on Sunday via email (12:12 pm) and said my deposit would be mailed on 4/26. He actually didn't mail it until the following Monday (4/30). We lost 9 hours in one day from waiting, and access to 1 bedroom/1 bathroom. On top of that we missed an event for the group we planned on Saturday. We requested a partial refund for our time and troubles. Bill chose not to refund anything. Renter beware. It's always unfortunate when a plumbing issue happens or any other issue for that matter. When I received the call from Angela, I was currently in the Chicagoland area. It took me 3 hours to get to the home to see what was going on and in the interim I did contact my plumber who was currently on other calls but said I'll bump this call up to a priority. The plumber did show up and found there were female products that clogged the plumbing system. The issue here is all Plumbing worked prior to this party arriving at the home. Even though the Angela stated that females did not have any issues that weekend, I took them at their word however as most of us know sometimes people don't always tell the truth when problems or expenses arise. It's unfortunate we received a 2-star review when all other reviews have been 5 Star reviews. Things do happen and we addressed it the same day and I drove 3 hours to assist this party. Angela never asked for any type of partial refund. We had a very good realtionship over the phone so I'm very surprised she is being dishonest about a partial refund comment. In this case do I offer a partial refund? I considered it however the plumbing was working just fine before the party arrived. I did give them their security deposit back in full. Most owners would have had the renter pay for the plumbing issue that was caused during their stay. Again all Plumbing including toilets and showers worked fine during the week prior. I apologized that this situation happened however theirs a very good chance it was caused by somebody in their party. I do have signs in each bathroom that states no products accept toilet paper to be placed in toilet. I take great pride in making sure that everything in the home is working properly and when a problem happens we address it immediately which we did in this case. I have over 70% of families come back to stay at my home again. 2017 Rental for September and October maximum people to sleep is 13. Please call to discuss. Seven,,,zeeroo,, eight,,,eightt,,fourr, suxx, nin,,zeeeroo,,nin...zerroo.